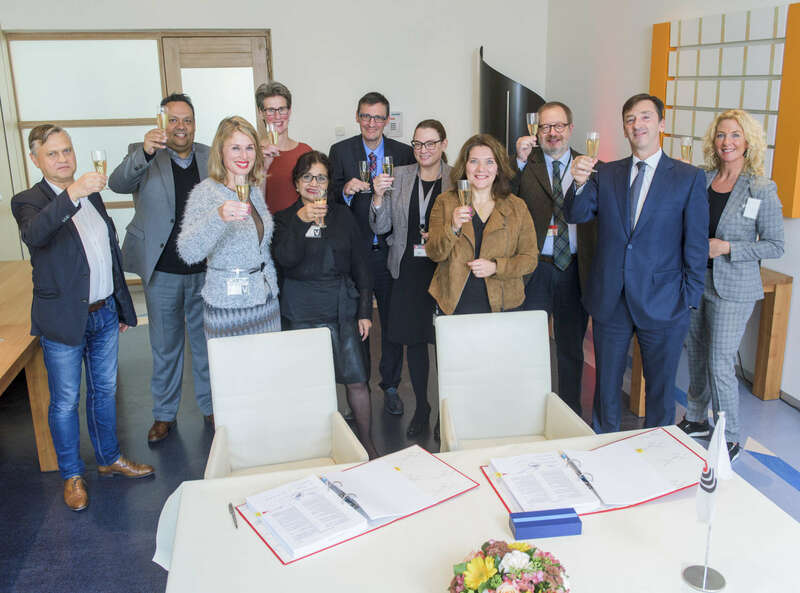 Friday, 21 October, the European Patent Office (EPO) and Gom Schoonhouden signed the integrated facility management contract between the two parties. Gom Schoonhouden, part of the Facilicom Services Group, was chosen in a tender procedure to be the cleaner on the location of the EPO in Rijswijk, Zuid-Holland. Gom will provide the cleaning service, part of the window cleaning, waste management, winter services and the sanitary materials for the largest international organization in the Netherlands. Jolijn van den Hengel, manager of the bid and tender team, is particularly proud of the award. "We were picked because our offer proved the strongest in the overall assessment. During the award interviews the building supervisor and project manager demonstrated well that they could place themselves in the shoes of the project leader of the EPO. Furthermore, we scored high on partnership, contract optimization and quality. Therefore we are, after Trigion Security, the second Facilicom company that performs work for EPO. Because the site has more than 3,000 employees from many European nationalities, a good command of the English language was an important factor in the choice of staff to be deployed. "To start with, we had our employees undergo an English language test. Where necessary we have arranged additional training so that our employees are not hindered in their customer contact. With view to customer satisfaction, customer contact is particularly important." says Jolijn van den Hengel. Gom Schoonhouden will take up its work on the site in Rijswijk on 6 November.